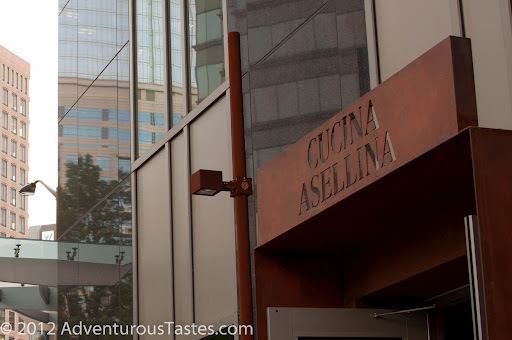 The Mr. and I recently returned to Cucina Asellina, sister restaurant to STK next door and another NY transplant, to scope out more of their menu. The scene at Cucina is much lower key than the thumping steak-and-cocktails fueled party next door. We enjoyed the patio during one of Atlanta's perfect spring nights and found it to be a perfect place to unwind and people watch. Service was friendly and knowledgeable and the crowd seemed Midtown hip, but in you-don't-have-to-get-dressed-up-for-it kind of way. The menu was created by Chef Marco Porceddue, an honest to goodness I-talian, so that bodes well for its authenticity, right? We were lucky enough to be treated to a chef's choice dinner when we dined. 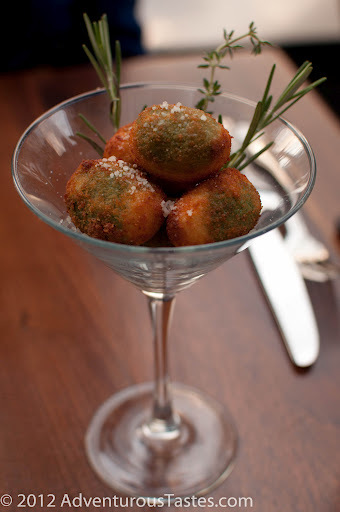 Our only request - we simply had to have the stuffed olives again. These little babies are stuffed with veal and parmesan with a light semolina coating. Wow, for something so small, they pack a ton of flavor. I could eat an entire meal of these. They're just that good. A chilled seafood salad was fresh and light, and I appreciated the sweet cantaloupe to balance out the citrus tang and bitter frisee. 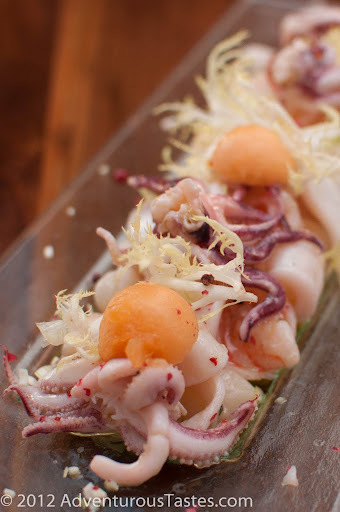 I rarely get seafood other than sushi, so I was glad to taste something different than my normal meat-centric order, but I must admit, I'll still take meatballs over octopi anytime! 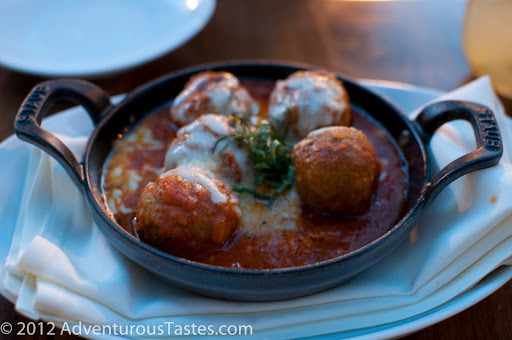 Cucina Asellina's veal meatballs are particularly good. Tender and light and perfectly delectable served with fresh tomato sauce, mozzarella and basil. The Mr. is 100% Italian himself and makes some seriously delish meatballs, and he was raving, so take that as a serious endorsement! A saffron strozzapretti was an interesting departure from the typical red sauce pasta. 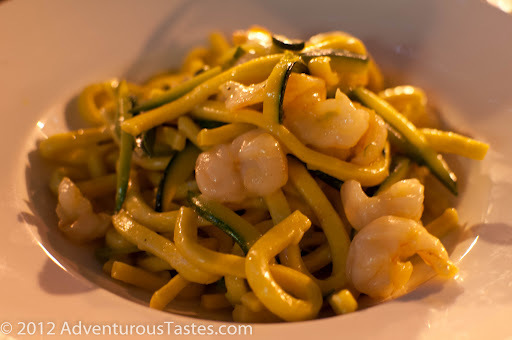 Seafood pasta isn't my favorite, but I appreciated the contrasting textures of the thick chewy pasta ("priest stranglers" in Italian) with the sweet little shrimp and fresh slivers of zucchini..
Best of all may have been the off-menu Truffle and Egg Pizza. How much do you really need to say about such a concoction? 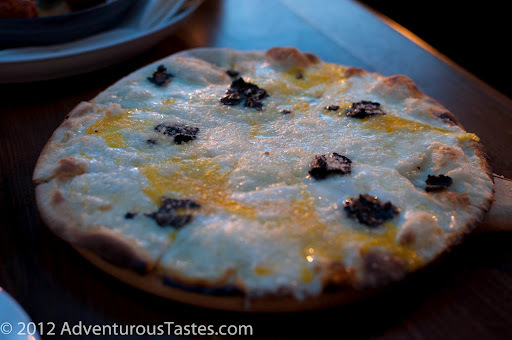 It's redolent of truffle and ooey gooey rich with egg. Heaven! Although not on the menu, I gather it's a pretty open secret, and you can get a hold of one any night. Don't miss it! It's still early days at Cucina Asellina, but already the place seemed to have a handle on great service, a cool vibe, and plenty of craveable eats. We'll definitely be back!